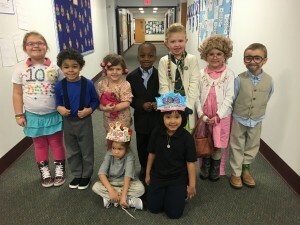 The kindergartners at Clinton Young had a great time celebrating the 100th day of school! The students were invited to dress as if they are 100 years old and completed several themed literacy and math stations throughout the day. How many times can you stand up and sit down in 100 seconds? The students experimented and discovered they could complete the task 72 times! 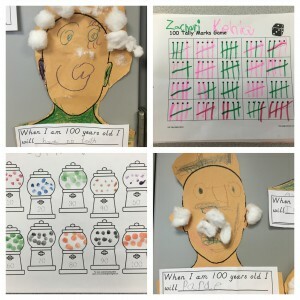 They also made 100 tally marks, made predictions about life 100 years from now, painted 100 gumballs, and even made special necklaces from 100 pieces of cereal!